I got to cooking this dish only at 8.30pm last night. Having returned from my walk-run I peered into the refrigerator to figure out what to cook, yup on weekdays, that’s what happens, whereas weekend meals are planned weeks in advance! 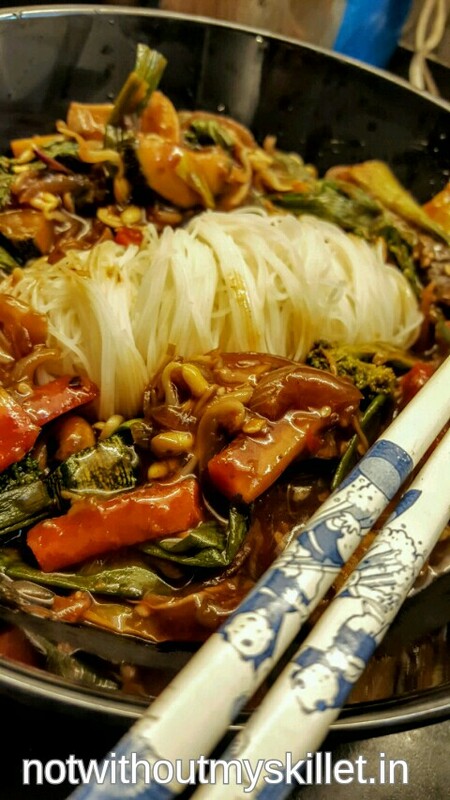 I had enough veggies for a stir fry and I did have some gluten-free rice noodles in my pantry. All I needed was some mushrooms to round-up the dish. That bought, it was a 10 minute job, considering these noodles don’t need to be boiled. You can of course use your normal Chinese noodles with it too! 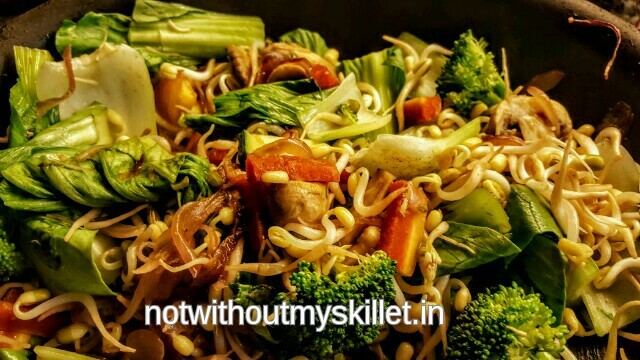 A sumptuous meal, a bowl full is all you need! 1/4 tablespoon each: dried celery, paprika, sesame seeds, five spice powder. Mix together. You can buy ready-made Keya Chinese seasoning too. Quick cook is the healthiest way to eat! 1. 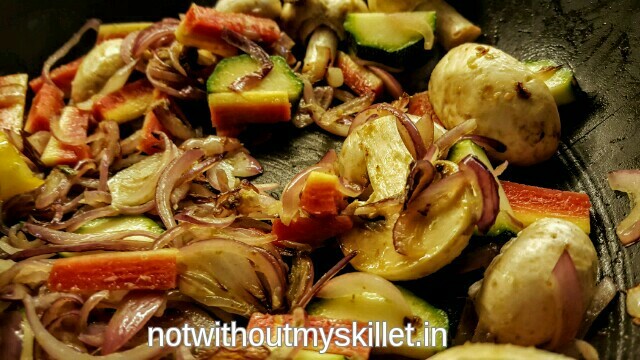 In a skillet heat up your oil, and add the dried spices and ginger-garlic paste. When it’s well heated, add the onions and cook till translucent. Remember you need a thick bottomed pan and need to cook on a high flame. 2. Add the zucchini, carrots and mushrooms and let them caremalize. 3. When they get a brown tinge, but haven’t lost their firmness, add the rest of the veggies. If using tofu add now. If using sausages, add pre cooked and chopped sausages now. 4. Mix together the sweet garlic chilli sauce, soya sauce, chilli sauce, corn flour, water and add it to the veggies. When it starts to thicken, take it off the heat, check for flavours and season with salt and paprika if needed. Your stir fry is ready. 5. Now for the noodles, (if you can look after 2 things cooking together place a pan half filled with water to boil at stage 2, otherwise take the stir fry off the flame at stage 2 and go back to it once your noodles are in the boiling water). When the water comes to a boil, take it off the heat and add the noodles and let it steep in the hot water, this helps the noodles soften. It needs about 5 minutes in hot water. 6. To serve. 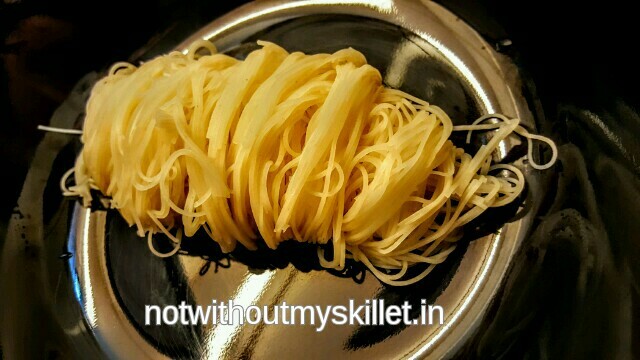 Take a large fork or cooking tongs or forceps (you can use the chipya/ chimta used to roast rotis on an open flame) and hold some of the noodles in it and wrap the rest around the tong by rotating your hand with the noodles in it in a single direction, just like you would fork spaghetti on your fork. When a fair amount of noodles is on the tong, wrap the ends around it and place the end of the tong in the centre of your serving dish. Now with another spoon, push the noodles off the tong slowly such that the curves are maintained. 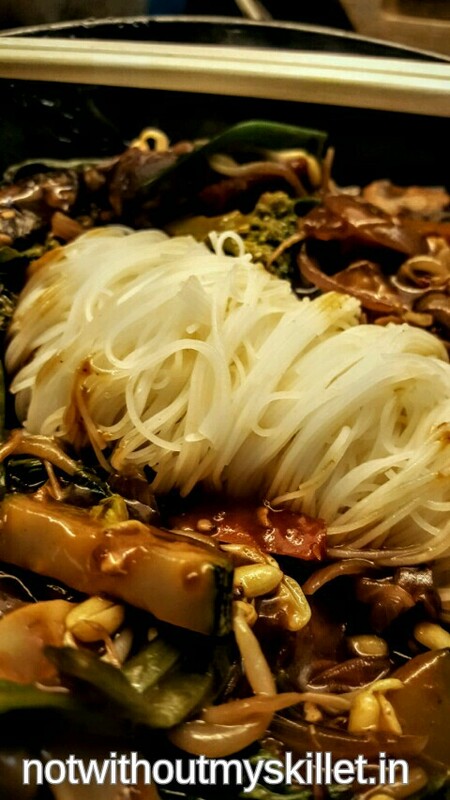 You should get a roll of noodles positioned as shown. 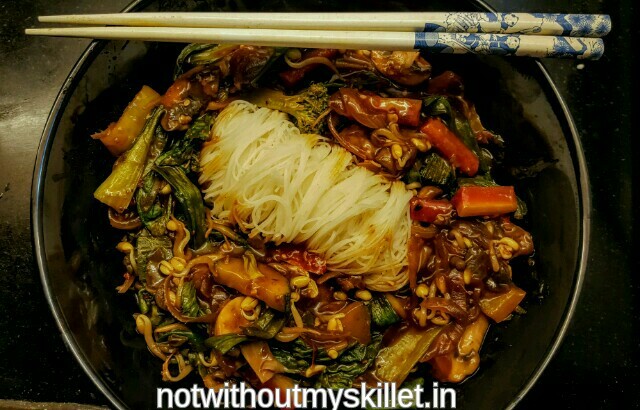 Now place your stir fry all around the noodles and serve hot.